Once this blog was started, like any geek, I wanted to make fantasy into reality… The easiest way possible? FOOD of course! The Geeky Chef is probably one of those most well-rounded and creative geek food blog I have seen to date. She covers everything from Books, movies, TV shoes and video games. It truly is an inspiration to those who want to follow with this type of blog. The Middle-Earth Foodie is a great blog for big Lord of The Rings fan. It takes the recipes found on Middle-Earth Recipes (which is a very thorough site of recipes from The Lord of the Rings) and brings them to life with lovely photographs. Fabulous compilation! Lastly, The NewEgg Pinterest Board. 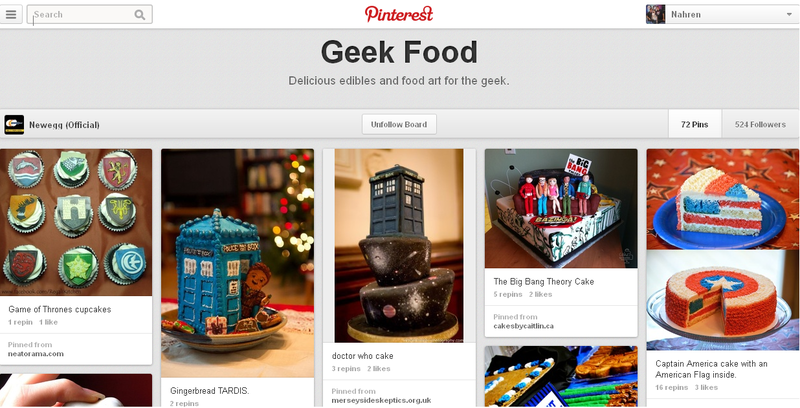 Although this is not a geek food blog, this board is dedicated to all geeky foods. Some of these creations are gorgeous and very intricate – this board is definitely something to enjoy! What is a Pumpkin Pasty? 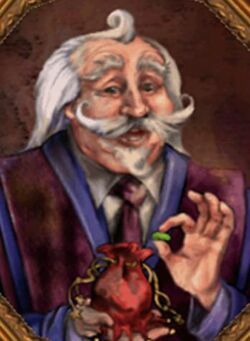 “Pumpkin Pasties are a wizarding food sold by the Honeydukes Express on the Hogwarts Express. They are sort of like a Cornish Pastie, but filled with pumpkin instead. Harry Potter tried them for the first time on the Hogwarts Express, at the start of his first year, when he famously impressed Ron Weasley by buying everything from the trolley saying “we’ll take the lot”. He bought some of everything off the food trolley, and then shared his food with Ron Weasley. Pumpkin pasties were referenced in Harry Potter and the Philosopher’s Stone and Harry Potter and the Goblet of Fire. 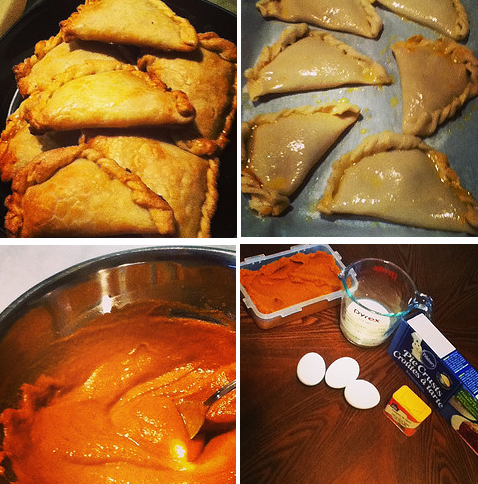 No worries, you can make your very own pumpkin pasties! Take pie crust and cut into quarters. You should end up with 16 triangles. Mix eggs, pumpkin, evaporated milk and brown sugar in a bowl until incorporated. Add cinnamon, ginger, cloves and salt, stir well. Take a triangle of crust and pinch together two ends so that you are left with a cone. Scope in 2-3 tablespoons of pumpkin mixture into the cone and seal shut. Repeat until all the crust is done. You may have extra filling, you can always put it in a ramekin and bake it to enjoy. Bake for 45 minutes or until puffy and golden brown. Let sit at room temp or refrigerate for an hour before enjoying. Enjoy your Monday class treat #BSMRCCE! not sold there very often. In Diagon Alley, the drink has been known to be sold at the Leaky Cauldron. Butterbeer has appeared in Harry Potter and the Prisoner of Azkaban, Harry Potter and the Goblet of Fire, Harry Potter and the Order of the Phoenix, Harry Potter and the Half-Blood Prince and Harry Potter and the Deathly Hallows. It may have a very slight alcohol content, which could get house-elves in a drunk-like state,though an antidote to this exists. It seems to have aless pronounced effect on humans than smaller creatures such as house-elves, but humans can still fall “under the influence” of it. 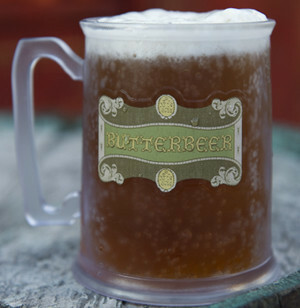 Butterbeer can be found at The Wizarding World of Harry Potter in Orlando, Florida, Universal Studios. It can be served either cold with a taste similar to cream soda or frozen as a slush with a butterscotch-like foam on top. Butterbeer is also served at The Warner Brothers Studio Tour in London, England. Can’t make to the pub? No worries, sometimes it’s just too cold to make the trek. 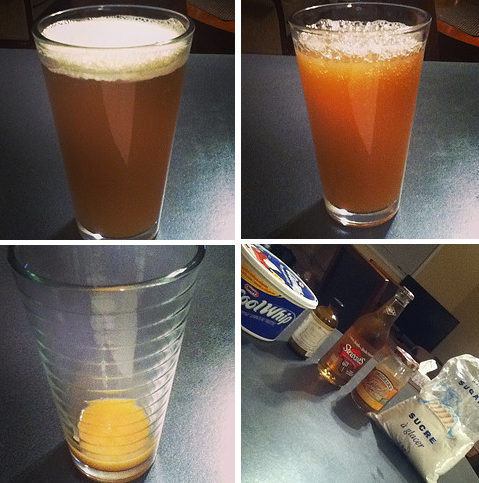 Here’s how you can make your own butterbeer at home! Add vanilla, butterscotch and water at the bottom of a glass and stir until dissolved. Pour in a little cream soda stir well, and then top off with the remaining cream soda. Mix whipped topping and icing sugar until smooth. Spoon over top of the butterbeer and enjoy! Do you know what March 14th is? “Pi Day is an annual celebration commemorating the mathematical constant π (pi). Pi Day is observed on March 14 (or 3/14 in the month/day date format), since 3, 1, and 4 are the three most significant digits of π in the decimal form. In 2009, the United States House of Representatives supported the designation of Pi Day. 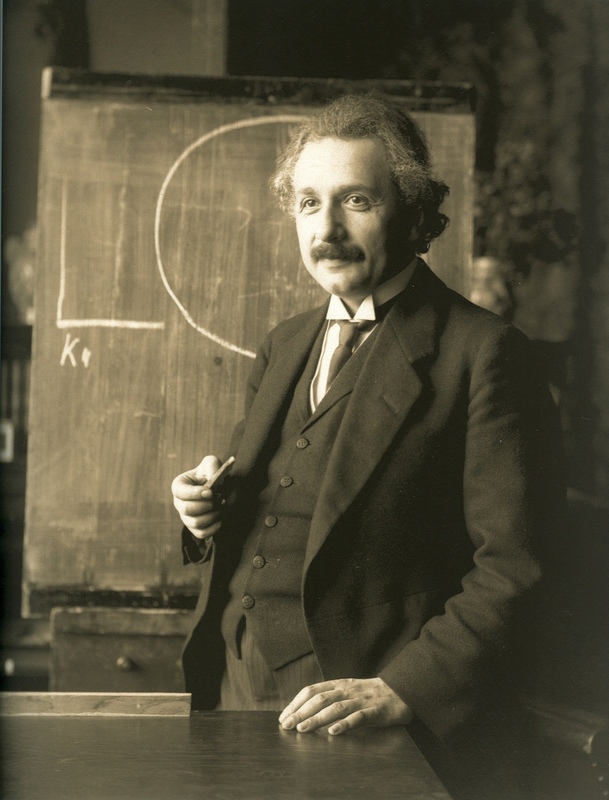 Where did Pi Day come from? “The earliest known official or large-scale celebration of Pi Day was organized by Larry Shaw (Photo, right) in 1988 at the San Francisco Exploratorium, where Shaw worked as a physicist, with staff and public marching around one of its circular spaces, then consuming fruit pies. Awesome reasons for eating pie on Pi day? My birthday is on March 14th ;)! It’s always a good time to eat Pie! Can it get more awesome then that? There is nothing wrong with a belated celebration. Also, please refer to the last bullet in the aforementioned list :). With that, I leave you with this awesome Pi Day pie chart from Shutterstock (very neat, totally check it out)! Mmmm #Doughnut? Oh what can it be, #BSMRCCE? DISCLAIMER: This is a post for my class, Building Social Media Relationships at The Centre for Continuing Education at McMaster University. This doughnut was free and this review was requested! Note: Yes, that is my favourite clip! You ever notice how our favourite shows make food taste even better. Such as the beloved Homer Simpson of The Simpsons. So, why am I writing about Homer Simpson? When I think of doughnuts, I think of Homer Simpson! 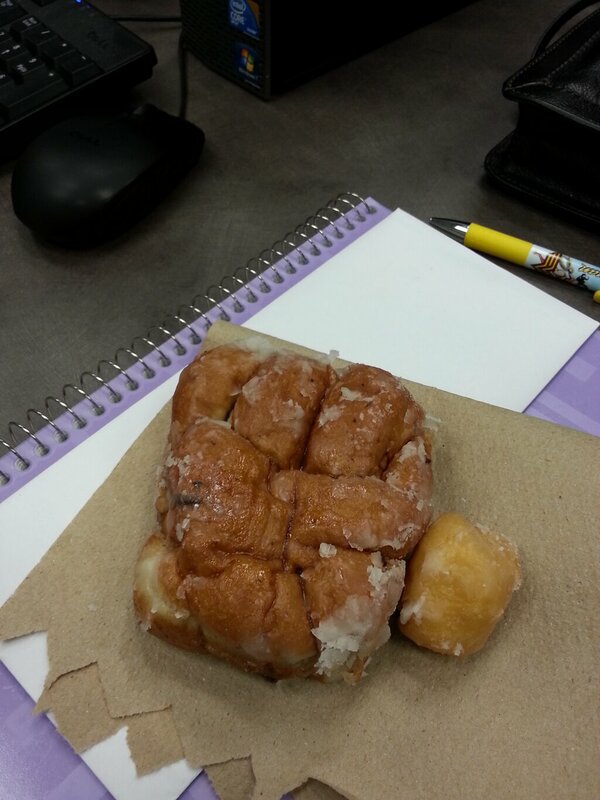 Our teacher Jarod, just gave us a FREE doughnut. We have to review said doughnut. I happen to choose a blueberry fritter… which, if you didn’t know, its one of the yummiest doughnuts around ;)! I, digress… Do you know why we got these doughnuts? In a previous post, I touched base on Bertie Bott’s Every Flavour Beans. I discussed existing flavours, experiences, all in a quick review with a lovely photo. But, I think I’d like to explain Bertie Botts a little more in detail. What are Bertie Bott’s Every Flavour Bean? The history in the Harry Potter series states that “Bertie Bott’s Every Flavour Beans are one of the most popular sweets in the wizarding world. 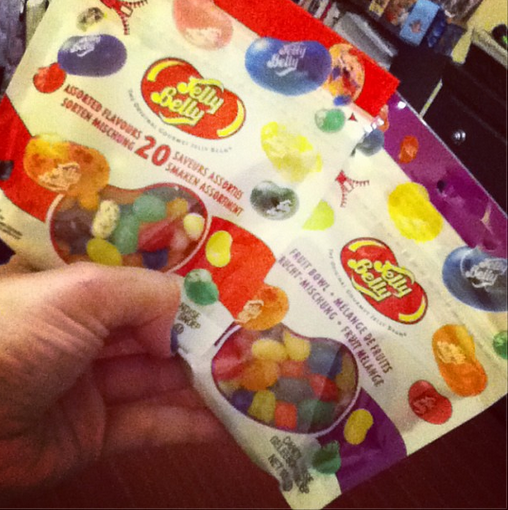 They are the same as Muggle (non-magical folk) jelly beans, except the range encompasses every flavour imaginable. There is also no way of telling for sure what flavour any given bean is without tasting it, although you can try and guess by the colour. A compilation of known flavours can be found on Mugglenet. -*Adapted from Harry Potter Wiki. How did we get Bertie Bott’s here in the ‘Muggle’ world? “In the real world, Jelly Belly released jelly beans with selected flavours from the series. There are currently 25 flavours available. The Bertie Bott’s candies may have been inspired by Jelly Belly, which produces jellybeans in unexpected flavours like jalapeno and encourages consumers to eat different-flavoured jellybeans in combination to create different flavours.”* -*Adapted from Harry Potter Wiki. Today, you will have a harder time finding the interesting flavours from the times of Bertie Bott, but Jelly Belly does have lovely jelly beans with a very neat spectrum of flavours. Give them a try, they are delicious and very realistic! In regards to Bertie Bott’s Every Flavour Beans, I did try a few, rotten cheese, pencil shavings, black pepper… Very, um, different. It wasn’t very tasty and the point was proven, “a risk with every mouthful”! 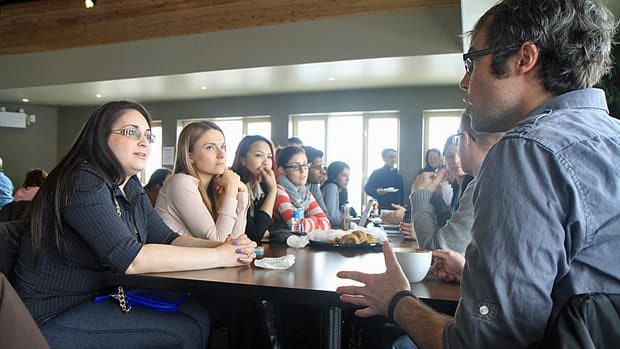 On Saturday, March 2nd, 2013, Hamilton held Canada’s first Geek Breakfast at Williams Fresh Cafe on the Hamilton waterfront. Aside from AWESOME, a Geek Breakfast is a “Community-Driven Breakfast for Technology-Minded People Each month attendees congregate over bacon, eggs and plenty of coffee to discuss topics like social media, digital marketing, design, programming, and ways to better their communities” – http://geekbreakfast.org/. Want to take part of the next Hamilton Geek Breakfast? Don’t be shy and ‘Like’ their Facebook page to stay up-to-date with upcoming Geek Breakfast events in Hamilton. What does one do at a Geek Breakfast? Well, you see a lot of great people in your community, in this case, Hamilton, Ontario. If you’re following all the top tweeters for the Hamilton area, you will likely see them there, almost celebrity like. You get the opportunity to introduce yourself as a person and not just @InsertHandleHere. I was fortunate enough to meet some great people, some from Twitter, some from the Social Media Research and Techniques class as well as some new people. Mind you, I’m a chatty gal, and I have to admit, I was shy at first, but there is nothing to be shy about! Social Media? I think so! I don’t think there was a soul there without some kind of mobile device. Laptops, tablets, smart phones, cell phones, you name it. Everyone had a device of some sort to tweet out and share the great events of the day. Connections were made and kept, it was a really great day for the use of social media. I would definitely go to this event again and suggest you also give it a shot. The only thing I would suggest is putting up a sign, us first-timers missed out because we weren’t sure where to meet. Although the next time, I will likely keep an eye out for the #HamOnt Twitter celebrities:)! It’s a lovely feeling to be around kind people with the same interests and have great discussions.